Ace broadcaster turned fashion designer, Kofi Okyere Darko (KOD) launched his Nineteen57 Freedom collection with a show stopping finale that saw the stars hitting the runway in his designs. The fashion show dubbed ‘Rhythms On Da Runway’ saw Reggie Rockstone, Jon Germain,Kwaku T, Funny Face, Tinny, Asem, Kwaw Kese, D-Black, Senanu Gbedawu, Benny Blanco and others modeling in the finale. 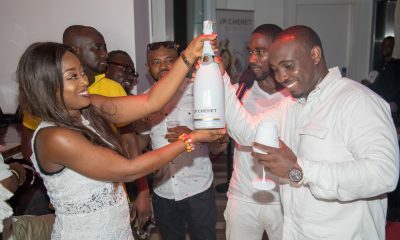 The event also saw collections from the wife of KOD, Ophelia Crossland of Crossland designs and performances from Bertha and Okyeame Kwame, RnM, Steve Bedi, Nana Yaa, Pat Thomas, Amandzeba and a surprise performance by Sarkodie. 20 photos that prove that 2019 VGMA nominees’ jam in Kumasi was lit!